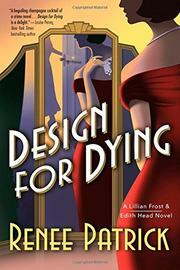 Patrick, a fig-leaf pseudonym for a husband-and-wife writing team, debuts with a tale that entangles not-yet-famed costume designer Edith Head in a case of Hollywood murder. The road to Miss Head’s acquaintance runs improbably through beauty queen–turned-shopgirl Lillian Frost, who’s shocked to hear that her former roommate Ruby Carroll has been shot to death and additionally disconcerted when the LAPD’s Detective Gene Morrow reminds her that although they’d quarreled and separated months ago, the two had met again quite recently when Ruby tried to inveigle Lillian into her scheme to borrow costumes from the Paramount wardrobe department, where Ruby had gone to work, and forget to return them. Lillian had indignantly refused, but there’s clear evidence that Ruby had found another accomplice: the gown she was found dead in had been worn by none other than Gertrude Michael in The Return of Sophie Lang, and a suitcase of Ruby’s Lillian discovers turns out to be full of clothing Edith identifies as Paramount’s very own. Why was Ruby so intent on swiping outfits that could have been easily identified when she might have availed herself instead of the largesse of her upscale friends Armand Troncosa and Princess Natalie Szabo? That’s an excellent question, and eventually Patrick provides an excellent answer—but not before Lillian and Edith have bonded over shared adventures, sartorial taste, and the travails of being a woman in 1937 Hollywood. Although the serenely levelheaded costumer designer gets to solve the mystery, Patrick often keeps her under wraps, and even the cameos by Gracie Allen, Bob Hope, Barbara Stanwyck, and Preston Sturges aren't an adequate substitute. Here’s hoping the promised series will redress the balance.